Ideal TARGA rally car project. Great runner and drives beautifully. Spare discs and calipers with mintex 171 pads. Petrol tank filler cap patch fitted (as pictured) & slight vibration from exhaust due to loose bracket. 2003 Ford Ka 1.3i Collection. Only 34,945 miles. Full Service History. MOT NOVEMBER. AIR CONDITIONING. ELECTRIC WINDOWS. The tyres are fine the ac was re-gassed last year and the battery was new last year. Ford KA 2011 Zetec. The car itself is in good condition and has been well looked after. The car is located near Goole, East Yorkshire. Pink ford ka for sale. MOT expired in February. Green Ford Ka 1.3. ONLY 55,000 MILES. Partial service history. In good condition considering it's age. Need a quick sale. Collection only. seels welded upon last MOT. Ford KA Studio , 1.25cc, 2013/63. The blue paintwork is in excellent condition overall. There are no bangs, knocks or other strange noises to be heard. Full Service History, One Lady Owner. The car has never been smoked in so there are no unpleasant odours. Ford KA stunning condition 99p start no reserve, first to see will buy. Amelia Cars Ltd - Call us on 441158963974 or click here to find out more. It starts and drives and has covered only 24,879 miles which have been verified as genuine at mothistorychecker.gov. No airbags deployed therefore, in my opinion, all that is now required to finish is a repair to the vehicles rear panel, re-connect tailgate wiring for wiper and rear brake light and fit rear bumper and light clusters. Great little car in a lovely unusual colour. Wellington Heath, Herefordshire. Recently had 2 new tyres. Had a new clutch in September 2018. MOT until September 2019. This is an amazing little car. ideal for a first car. very low mileage and in almost perfect condition. isofix in back seats for isofix carseat or isosafe carseats. collection only. minimal wear and tear for age. Edgintons of Inkford Cars - Visit us for a test drive - Call us on 441564333212 or click here to find out more. A RARE GENUINE 18800 MILES FROM NEW 2 LADY OWNERS. FORD 1.3 KA SPECIAL EDITION 70 COLLECTION. IT HAS ELECTRIC WINDOWS, POWER STEERING,2 TONE INTERIOR SEATS, COLOUR CODED BUMPERS. 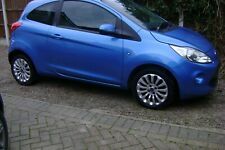 FORD KA 46,269 MILES. AIR CON, ELEC WINDOWS, ALLOY WHEELS. GOOD FIRST CAR.